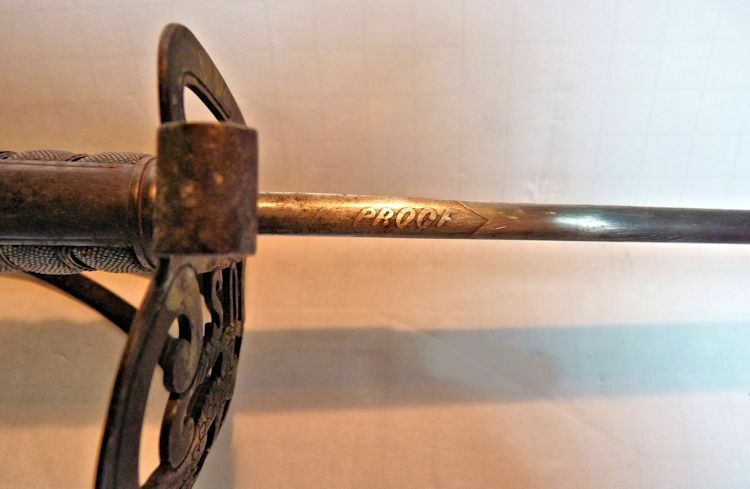 To view our current inventory of antique Civil War maritime & other weapons, click here! This Great Example Has Been Sold. 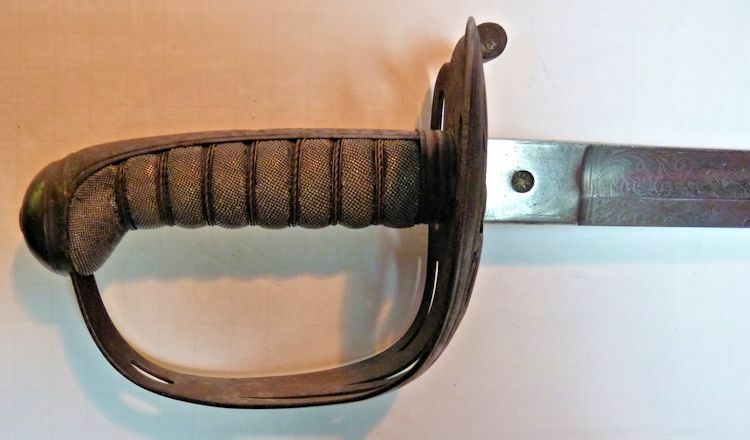 Presented is a fine quality, Nonregulation Union Officer's sword made of iron that was highly popular during the Civil War. All these swords were made in Germany and sold under various maker's names. This one is marked Solingen on the reverse ricasso along with a long feathered arrow while a round slug marked "Proved" on the reverse ricasso. Our research on the trademark concludes it is unidentified. The sword has a slightly curved blade with a long and wide single fuller. The design on the blade is well worn and requires proper lighting to be seen clearly. Approximately, 95% of the iron work has taken on a dark brown patina. Ref. See The American Sword, 1775-1945, by Harold L. Peterson, Page 83, Item 75. The blade maintains most of its original gloss on both sides with the design showing its features in proper lighting. 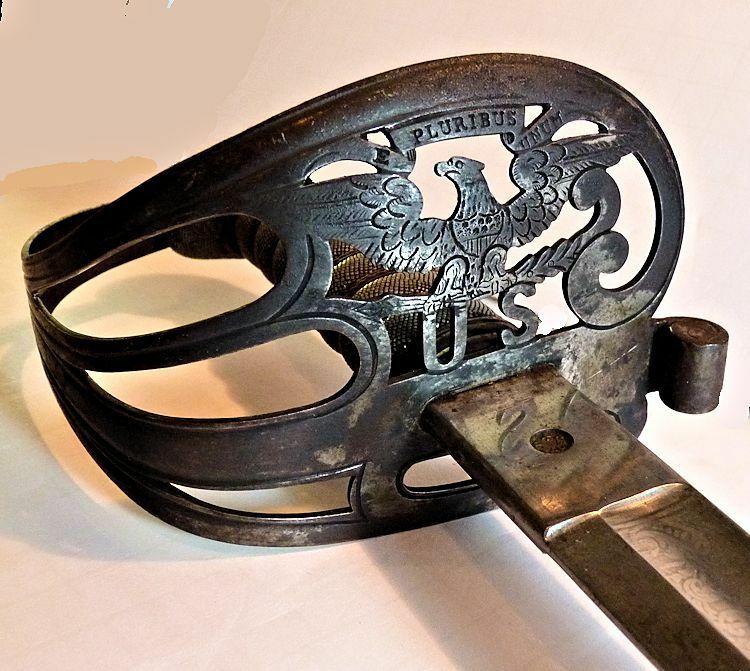 The body of the blade is etched on the obverse with floral designs, and an American eagle with ribbon marked E. Pluribus Unum. The reverse is etched with similar flora and a large "US" in the center. The spine is marked, "Iron Proof". There is very little mild spotting on obverse near the point. The cutting edge is unsharpened and without nicks. The washer is missing. Obverse hilt over. Solingen Mark on ricasso. Reverse hilt. The wood grips are fully covered with Ray skin and seven wraps of twisted three strand brass wire. A long back strap runs from the ferrule at the guard to the birds head pommel with the tang peened through the center. The guard is pierced to form a half basket with a prominent spread American eagle perched over a large "US" with "Pluribus" over its head forming the front. The single quillion at the top has a cylinder at its end. Arrows point to "US" on the blade. Iron Proof on the spine. 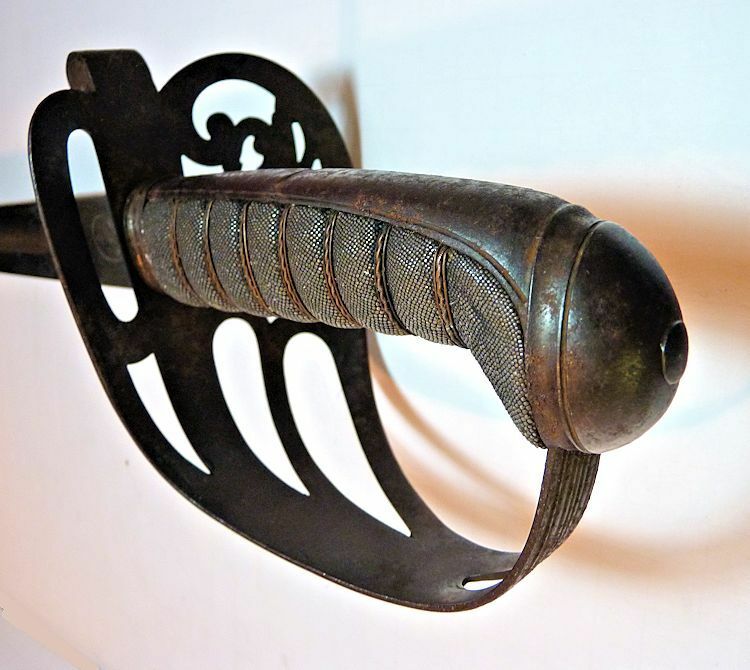 THE SCABBARD: is iron, 33 1/4 inches long by 1 1/2 inches wide at the throat. It has two bands with suspension rings and a large drag. The scabbard is covered with lightly spotted rust that has turned hard and covered in a dark brown patina for it entire length. Length overall when the sword is housed, 38 3/4 inches. Copyright 2017 by Land And Sea Collection™. All Rights Reserved.